How to make a campfire. Sounds easy? Well, if you haven't been roughing it for some time, these practical "how to start a campfire" tips might just come in handy on your next family road trip. Learn everything you need to know to be an expert fire starter on your next RV travel with kids adventure. The first point to consider when deciding how to make a campfire is exactly where you should start one. Now, this may seem obvious (and to most of us it is) but these safety points are always a good idea to keep in mind. At a bare minimum, you should start your campfire no less than 10 feet away from your RV, vehicles, tents, or anything else that you don't want to go up in flames. It happens. 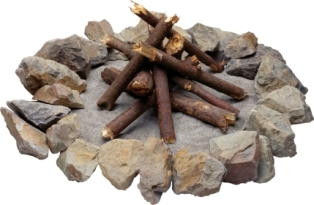 If the campground or camping area you are staying at provides a fire pit or rock ring for a campfire, use it, and only it. If not, it may be necessary to construct your own fire ring. Clear a circular area a couple feet in diameter from any brush, dried grass, etc. Line your circle with large rocks to keep the fire contained. There you go! Moving on with how to start a campfire. One word of caution: make sure the campground you have chosen allows campfires. 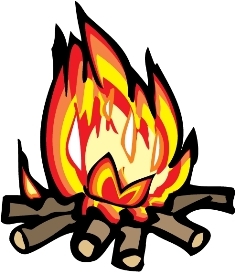 If there is not a designated campfire pit or ring, and you are on private property, chances are they don't allow campfires. When we started our RV travel with kids family road trip, we were floored with the amount of campgrounds that simply did not allow campfires. Really? A campfire seems so basic to camping! But, alas, insurance companies dictate regulations in many cases. Most state parks allow campfires. Once you've chosen the appropriate place to set up your campfire, the next step in how to make a campfire is to gather materials. There are two main methods to gathering firewood: buy it or find it. Personally, I prefer to find it. Walking around your campsite and into the surrounding woods should yield a plethora of suitable candidates. You want fallen trees, logs and sticks, not something that is connected to a live tree. One, if you go hacking up trees you are destroying nature, and two, live trees don't burn well. Your firewood needs to be down for several months/years to release as much moisture as possible so that it burns well. And if this sounds like too much work for you, you can always buy firewood. Many campgrounds offer it for sale, or local gas stations, groceries stores, and even roadside stands should have some. The going rate is approximately $1 per split log. In order to get your fire started (an important part of how to make a campfire, I daresay) you will need some kindling. Kindling is basically small, easy to burn materials such as moss, pine needles, paper, and small twigs. We usually send the kids out to collect kindling, and save newspaper, cardboard boxes, and used computer paper for this purpose. State and national parks are all about letting nature take her course. Most parks sell firewood at the visitor's center. What we do at state and national parks for free firewood, while still maintaining the "leave it alone" policy 100% is we collect unused, purchased firewood from abandoned campsites. Each afternoon, when staying at a state or national park, I'll take the kids and our little red wagon (works great for laundry days too) and go site to site looking for leftovers. This works amazingly well. We have campfires nearly every night (and we've stayed whole months at a time in state parks before) and have never, not once, purchased a single piece of firewood. How to make a campfire. Pile your kindling in the center of the campfire ring. Next, start with some smaller firewood and form a sort of tipi over top of the kindling. This frame will get you set up for an awesome fire! Next, using your Aim N Flame, light the kindling. You can blow on it or fan it with a piece of cardboard to get it going. If you run out of kindling, keep adding more. After you get a flame, add small twigs to your pile to get it roaring. In a few moments, your logs will start to catch. It's important to note that a good campfire does not require the use of lighter fluid or other flammables. Seriously. Save them for the grill. They don't work great with campfires because they instantly ignite, and die quickly. Once your firewood catches, add more firewood to your tipi as needed. Soon, your fire will be roaring! Just remember, never leave your fire unattended, and when finished, douse with water. Enjoy!